A charming wall mounted Pirate Head with parrot to add a nautical air to any situation. This resin, replica Pirate Head can be used on it's own or with our other Pirate theme decor items. 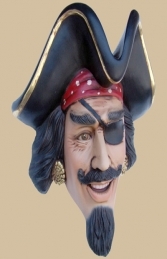 This fantastic wall-mounted Pirate Head with Bird is ideal for themed areas, advertising or drawing attention to your business. It can be used in any themed area or in shops, businesses, pubs, restaurants, coffee shops, adventure golf courses, zoos, theme-parks or even in your own home.